1889 - Moulin Rouge is a popular perfume by Histoires de Parfums for women and was released in 2010. The scent is powdery-leathery. It is still in production. "What kind of mother likes it? when her only son lives in a brothel?" This question was asked by a descendant of the Toulouse-Lautrec family many years ago in the television program "Ich tragen einen großen Namen". The charming gentleman, who to my knowledge also bore the first name Henri, was the living image of a French nobleman; he asked this question, smiling friendly, in entertaining German, in the room. Probably that's why I still remember her so clearly today. Yes, but seriously: Which mother would like that? This family can be traced far back in French history; even after leaving politics it still played a role. In order to protect the extensive family estate from division of inheritance, the marriage took place again and again within the close relatives. Even the mothers of Henri's parents were sisters! This finally also had a genetic effect on him: the only surviving son of the couple was small and, as his descendant reported at that time, he also suffered from the so-called "brittle bone disease". This was not yet recognized at that time; only the numerous bone fractures were frightening, which made the life of this man and artist so difficult and influenced. This is certainly the reason why he felt so at home in the bohemian and artistic world around Montmartre that in 1884 he moved into an apartment with friends in a back building near Place Blanche: his artistic talent made him "one of them". This was the location of the dance hall "Reine Blanche", which had to give way to the new building of the "Moulin Rouge" in 1889. Now the mention of places like Montmartre, Pigalle and "Moulin Rouge" automatically leads me to the Revue-Theater and of course to Henri Toulouse-Lauctrec. His life in the Bohème and his works, especially his memorable posters, are firmly connected with it. 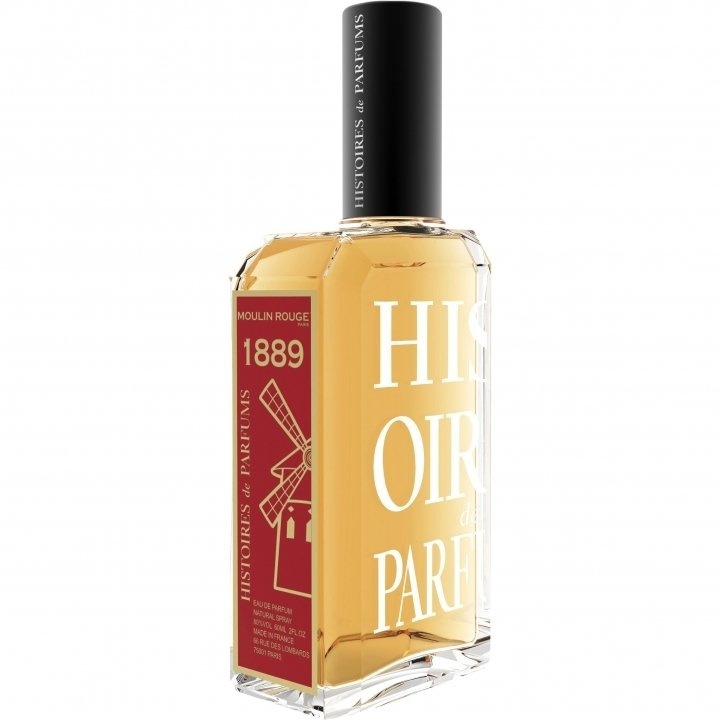 Which finally brings us to the fragrance "1889 - Moulin Rouge" by Histoires de Parfums. There live the fragrances history and this is also reflected in the name. Curious, I tested this fragrance and a good dose of herbal absinthe developed almost immediately on my skin. This drink, distilled from wormwood, anise, fennel and other herbs, is also called "green fairy" because of its green colour. Also infused with water, Absinthe comes from the family "scratch in the throat and makes crazy in the head!". Not so long ago, it was discovered that very strong consumption of Ansinth can damage vision. But nevertheless: this spicy entrée is very appealing to me. The freshness of the mandarin and the ripe spice of plum and cinnamon add to this; the thought of plum jam always comes to my mind immediately! Here an interesting fruity fresh spice mixture develops; because the Absinthe aroma cannot be put so fast into the corner. The result is a rather unconventional scent cocktail! The fully blossomed rose gives this slightly rural "street child" a certain noble touch, which is further enhanced by the elegant iris. Bright golden strands of patchouli and heavy musk lead this fragrance composition into the semi-world, which we are all quite curious about at heart. Only we don't have the courage to admit it honestly! HdP lets us at least get a taste of it. A little bit wicked is this scent already; but also very fascinating. To which the always a little dusty smell of fur (of which I can still remember well) contributes. Here the fur has been worn for a while, "spoiled"; it exudes a light leather aroma. Thus an unusual fragrance melange develops, which surely does not please everyone; it is too unusual for that. A lady will certainly never be "1889 - Moulin Rouge"; this is probably not planned. Therefore it is not a fragrance for the elegant lady or for business lunch - but quite wearable! For an entertaining evening (only maybe not in "big wardrobe") "1889 - Moulin Rouge" is a great companion full of esprit with the desire to sing along loudly. This spraying fragrance creature certainly feels at home in dance halls; you can spend a long evening with this companion without having to spray a lot. Also an evening before a small bar, somewhere on a street at Montmartre, this smell survives surely very well. He will feel at home there for sure. The fragrance develops vividly, Absinthe remains the dominant force for quite a long time: at least on my skin! - Not unpleasantly alcohol-heavy, but spicy, herbaceous. Personally, I wouldn't wear 1889 Moulin Rouge. But it was a lot of fun for me to get to know this fragrance and to go on a journey with it into a very colourful, whirling world unknown to me. The big revue staircase, lots of ostrich feathers and skirts waving around long, slim legs are of course part of it. A world that fascinates and attracts - a scent that is not everyday! What do I want more? to make Roxy Music a scent. in discarded clothes of several powder days. are still full of taste. Alcoholic, Sanostol, female gold ? The impression of an impression of an impression. through days of mild summer pee rain. It used to be all strong green here, like Absinthe. One must be able to endure its transformation. to the flowery, tender, powdery and fruity. in loop, and dirty compressed out skin. Well, Rock ´n Roll eben. "These foolish things remind me of you." What's your name, Virginia plain. Histoires de Parfums’s conceit of historical and literary themes is schtick. But what’s wrong with a bit of schtick? Trying to convey more than ‘lifestyle’ is a pleasant change in perfume PR. The need to mention both the year and the event the to tells you that the themes are not intended to be obvious. I’m instinctively leery of marketing, but HdP do take a stand against the the flanker mentality. After all how would they manage it? “1889, Fevrier” followed by “1889, Novembre”? I applaud the effort. It’s not merely a name trick, either. The HdP line is varied yet identifiable, and so far doesn’t seem to fill genre-slots with perfume placeholders. And it certainly keeps us away from (identifiable name), (identifiable name) liqueur de parfums, (identifiable name) les cuirs de parfums, (identifiable name) sunessence eau legere du bois blond avec les fruit du cosmos, etc. 1889 refers to the Moulin Rouge and would assumedly be boisterous, huge and have little self-restraint. I thought it would be the glam-rocker of the bunch. (That would be 1804.) At the risk of mixing eras, I’d imagined, a sort of ‘what happens in the Moulin Rouge stays in the Moulin Rouge.’ On the contrary, 1889 turns out to be a rather quiet and contemplative perfume. It starts out smelling like the inside of a purse that has a ripe pear in it. As others have mentioned it is a lipsticky, face-powdery iris fragrance but it also has a sweet, fruity side. I’ve seen prune, plum, tangerine listed as notes, but it smells like pear to me. It simmers down pretty quickly and in the end it's fairly reserved and stays close to the skin reminding me a bit of the iris-hyacinth accord found in Lutens’s Bas de Soie. Cool, matte, muted. Moulin Rouge? More like a red herring. I have been on the stage for the last 25 years ... give or take ... I'd prefer 'take' :). I don't hide the fact that I am a performing drag artist ... who cares?? It's 2012!! I have performed on big stages and I have performed on tiny stages, on TV and in movies ... this fragrance immediately transports me to the most hallowed of places for people like me ... the dressing room! As an artist, this is the place where all of the vital stuff happens ... the prep. What is seen onstage is simply the culmination of what happens back there ... its a little world all of it's own. 1889 - Moulin Rouge is about as 'over the top' as any fragrance can get. The opening is dusty, as the dressing rooms of the most revered theaters tend to be, a touch fruity (orange peels in a wastepaper basket) and a pinch spicy (the cinnamon here is short lived on my skin). The fragrance unfolds typically ... a well worn leather makeup case is opened next to a bouquet of opening night roses, the heat from the lights around the makeup mirror intensifying the fragrance of slightly warm lipsticks (iris) emanating from within. The musky intensity of greasepaint and slightly soiled makeup brushes overwhelms slightly, while at the end there is the scent of damp costumes piled into a laundry basket, faint traces of sweat mingling with the sweetness of the cheap body spray it was somewhat disguised in. I would hesitate in recommending this frag to just anyone. The wearing of it demands an intimate knowledge of this clandestine world. Make no mistake, this is a Diva ... slightly frayed around the edges, morally questionable ... but in the realm of that which she calls home ... MAGNIFI-SCENT. Gents, don't even go here unless you enjoy getting up in a party frock :) ... this one takes absolutely no prisoners!! One can hardly expect subtlety from a perfume with a name like 1889 MOULIN ROUGE, even produced by the illustrious house of Histoires de parfums, and in fact it's pretty much in your face (nose) with obnoxious sillage and longevity that can be curtailed only with a hot bath. This creation has a loud cinnamony-fruity—obviously intended to be red—personality perhaps befitting of one of the ladies who graces places such as the Moulin Rouge. For me, it's all a bit too brash, not at all seductive, and although I am confident that this composition contains only niche-quality components, they add up to all too much, proving yet again that sometimes less is more. The dominant scent in the opening could be approximated by eating a large quantity of Fire Stix Jolly Ranchers candy while swilling down copious volumes of cheap, sweet, jug red wine. In a word: yuck. The drydown comes closer to a mix between Chopard MADNESS and one of the Givenchy floral fruity frags. 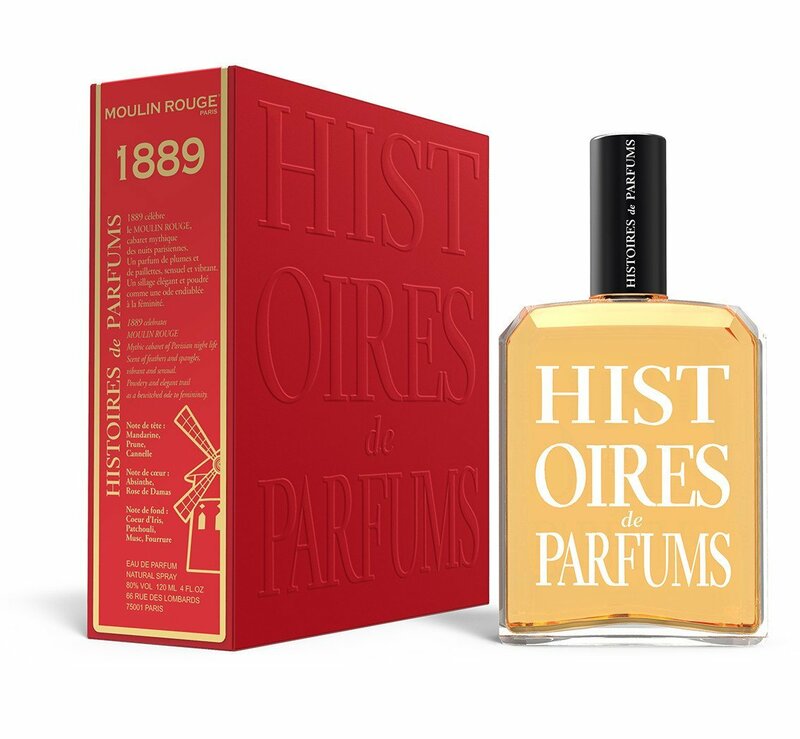 There's got to be a drugstore Dana facsimile of 1889 MOULIN ROUGE out there somewhere for those who like this sort of thing, but Histoires de Parfums has managed to convince me that even the best of ingredients cannot make such a perfume compelling to me. Désolée. Write the first Review for 1889 - Moulin Rouge!